Sierra Leone has been declared officially Ebola free. It was met with a mixture of sadness and celebration and things are now trying to get back to normal. The economy was badly hit, farm food supplies damaged, businesses closed. The youth who come to WAYout lost their ‘hustles’ and we are still providing one meal a day for them. WAYout stayed open throughout, unlike most youth organisations and we provided shelter during lockdowns and food support. 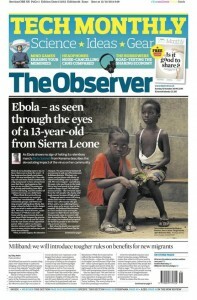 There has been a small outbreak of Ebola this year, but we are all hoping it will be an isolated incident. On Sunday, 27th September, the last two known Ebola cases were discharged from hospital in Makeni. The new, and hopefully last, count down begins towards Ebola free status. WAYout was one of the few youth organisations in Sierra Leone to stay open throughout the Ebola crisis. The numbers of youth coming in daily rose and they were involved in awareness raising through music and films. 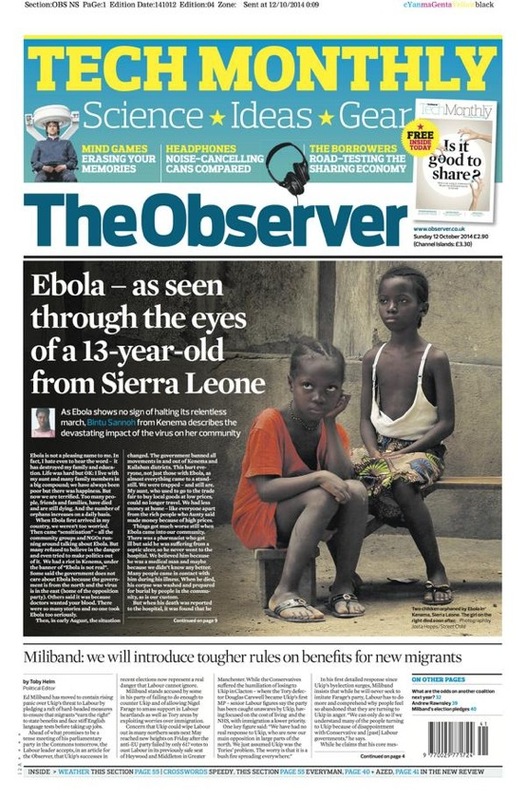 Josta Hopps had a photograph published on the front page of the Observer (above) and Susan Kargbo won the Photoshop Ebola poster competition (above right). We have recorded 3 music tracks aimed at different audiences. Hip-hop Ebola by Black Street Family. 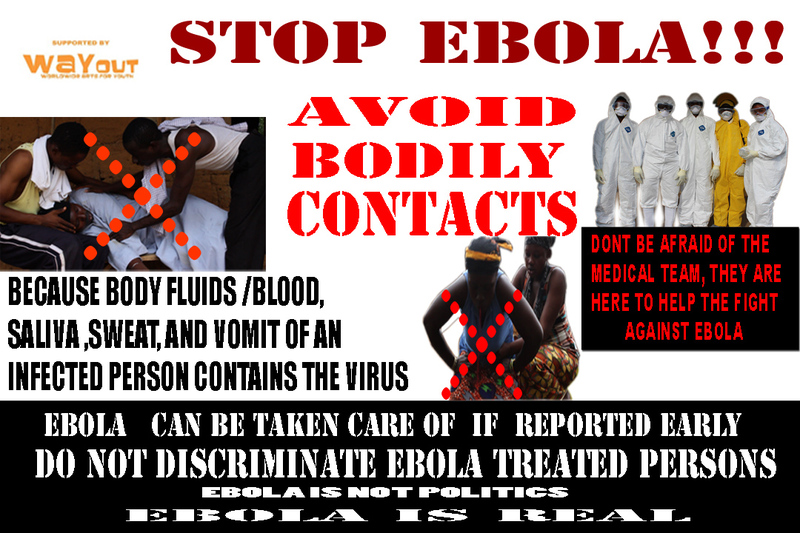 WAYout Ebola Sensitisation Track and The Way group’s Ebola track. WAYout shot films for Street Child, which were broadcast on most major channels including BBC’s Newsnight, Pikin Paddy, about their Ebola children’s Unit and the UNFAO, focusing on the impact of Ebola on farmers. We have been running sessions on how you catch it, how you don’t catch it, symptoms and the importance of going to hospital as early as possible for treatment. We are planning a series of documentaries tackling the stigma survivors face and to help people deal with trauma. So we are appealing for your continued support in this difficult time. This ebola crisis strained our resources and we continue to need your help. As of 15th February 2015, according to the Ministry of Health, there have been 8239 confirmed cases and 3421 deaths from Ebola. Healthcare workers are visibly struggling, the response to the outbreak has been damned as “lethally inadequate” and although the numbers of new cases were dropping they have now levelled out again. 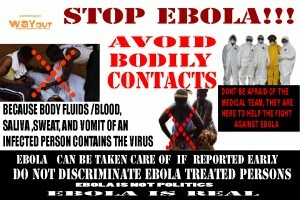 Deaths from Ebola are badly affecting communities and so are actions taken to try and control the disease. The farming community has been particularly badly hit. The three day lockdown came at a time when they would normally harvest crops. Instead crops were ruined and eaten by bush animals. Bush animals used to be killed, both to protect crops and as a source of food, but the ban on killing bushmeat has meant crops being eaten and a loss of food and livelihoods, especially for women. Gatherings were banned so farming methods that require group labour could not go ahead. People are so hungry they are eating the seeds they should be planting, selling small livestock like sheep and goats in order to buy food or going hungry. Dr Christopher Dye of the WHO says “If current trends persist we would be seeing not hundreds of cases per week, but thousands of cases per week and that is terribly disturbing.” The World Health Organization is using an educated guess of 20,000 cases before the end and for the first time since the outbreak began, the majority of new cases are outside the epicentres. Officially the World Health Organization is saying the outbreak can be contained in six to nine months. But that is based on getting the resources to tackle the outbreak, which are currently stretched too thinly to contain Ebola. Prof Neil Ferguson, the director of the UK Medical Research Council’s centre for outbreak analysis at Imperial College London, says “The authorities are completely overwhelmed. The epidemic is increasing, it’s still growing exponentially. This summer there have been many globally important news stories in Ukraine and the Middle East, but what we see unfolding in West Africa is a catastrophe to the population, killing thousands in the region and we’re now seeing a breakdown of the fragile healthcare system.” Prof Jonathan Ball, a virologist at the University of Nottingham, describes the situation as “desperate”. His concern is that the virus is being given its first major opportunity to adapt to thrive in people. The malaria season, which is generally in September and October in West Africa, is now starting. Will there be capacity to treat patients with malaria? Will people infected with malaria seek treatment if the nearest hospital is rammed with suspected Ebola cases? How will healthcare workers cope when malaria and Ebola both present with similar symptoms?